There is no way to understand the nature of our predicament except by confronting our history as an empire. That is the only way to comprehend the Iranian demand that we acknowledge our long-term interference in their affairs, the widespread anger about our acquiescence in the progression of Israel’s settlements on the West Bank, the Russian charge that we apply one standard to them and another to ourselves and the deep resentment of us among the peoples of the poor countries. The only way we can come to terms with those matters is to look our imperial history in the eye without blinking, flinching or walking away into the wonderland of Woodrow Wilson’s saving the world for democracy. Let us start with a definition of empire: the use and abuse, and the ignoring, of other people for one’s own welfare and convenience. America was born and bred of empire. That does not mean that we are unique; indeed, just the opposite. We are different only because we acquired the empire at a very low cost, because the rewards have been enormous and because until now we have masked our imperial truth with the rhetoric of freedom. Make no mistake about it: the imperial way of life produced the promised rewards. It generated great economic wealth and effectively limited social discontent. But we must also report the costs. I do not for a moment dismiss the people killed and the property stolen, but I would suggest that the greatest price was paid in the coin of our sensitivity about what we were doing and how that was understood by other peoples. We were already assuming that our right to security transcended the traditional right to defend what we had and had become the right to perfect security in any imaginable future contingency. We began to define security as the natural right to empire. Americans became so habituated to empire as the price of freedom that they demanded ever more freedom and ever more empire. Andrew Jackson was at once a prime mover and the symbol of that new enthusiasm for the imperial way of life. More freedom at home and more expansion elsewhere. People like the Cherokees were clearly backward—and so a threat to the American Way. Move them out and force them to adapt. And all the while other Americans, the merchants, the shippers, the sealers, the whalers and the Navy, were busy defining the sea itself as another frontier to be penetrated, controlled and exploited. There is a fine irony in the way that the great war for American freedom led on to ever more empire. And it is fitting that Lincoln provides us with an insight into the dynamics of that process. He knew, by December 1862, that the gamble on a quick victory had been lost. He had to have money and men in large quantities. He therefore appealed to the imperial tradition. Speaking to the agricultural majority, he wasted no euphemisms. He told them that they had to stay the course because it was not enough to have access to the world via New York and San Francisco. It was also necessary to control New Orleans and the Gulf of Mexico. The significance of Lincoln’s appeal to Western farmers to fight on for imperial objectives upsets historians of every political persuasion. Radicals resist the notion that ordinary folk support imperialism. Conservatives cannot easily come to terms with the reality that empire is related to liberty as they define it. And liberals long to resolve the dilemma by defining empire as global freedom and welfare. There is no inherent or logical connection between being a domestic reformer and an anti-imperialist. History never provides programmatic answers. But the best thing that can be said for our American empire is that we produced some very good questions. Now is the time to begin answering those questions. Can you even imagine America as not an empire? I think often about the relationship between those two words—imagination and empire—and wonder if they are incompatible. The truth is that I think they are incompatible. Do you want to imagine a new America or do you want to preserve the empire? Now, as surely we all know, preserving the empire is an exercise in futility. We will sizzle or suffocate. So let us get on with imagining a new America. William Appleman Williams (1921–1990) published his first articles in The Nation in 1956 and continued contributing until 1985. Looking back to 1980, in the months leading up to Ronald Reagan’s election, only a few political commentators seemed to grasp the significance of the moment. Not so much that something bad loomed ahead—Reagan and the ascension of the New Right—but that the United States had already plunged into a fun-house reality, where words had become divorced from meaning and political abstractions had warped into their opposites, freedom chief among them. But to describe the United States with the noun “empire” rather than the adjective “imperial” was a step more than most establishment intellectuals were willing to take. It put the focus not on the excesses of rogue executives but on the essence, the life being, of a nation conceived in expansion, born into slavery and eliminationist violence, and raised to believe that its will to infinity represented the general interests and best hopes of all humankind. No one was more associated with such a position than William Appleman Williams, a professor of history first at the University of Wisconsin, Madison, then at Oregon State, and who also, from the 1950s through the ’80s, wrote for The Nation. It would be impossible to overstate Williams’s importance. His most famous book, The Tragedy of American Diplomacy, was published in 1959. This meant that well before the United States dove deeper into Vietnam, before Nixon and Kissinger started bombing Laos and Cambodia, before Washington reacted to the Cuban Revolution as if it were Petrograd 1917 and imposed its embargo, a generation of New Left scholar-activists had a powerful framework not just to morally condemn but to analytically dissect American foreign policy. At Madison and elsewhere, his influence was felt inside academia and out, among a diverse roster of students, activists and independent intellectuals who presided over a renaissance of American thought, including Herbert Gutman, Walter LaFeber, Lloyd Gardner, Martin Sklar, James Livingston, James Weinstein and Eleanor Hakim, as well as the founders and early fellows of the Institute for Policy Studies: Marcus Raskin, Richard Barnet, Eqbal Ahmad and Saul Landau. Established in 1963, IPS became closely allied with The Nation, institutionalizing Williams’s scholarship in its policy recommendations. When the economist Robert Heilbroner, in a 1967 Commentary essay, called the United States a “counterrevolutionary” force in the world, he was ventriloquizing Williams. To find an intellectual today doing the work that Williams did in his time—one who could fluently combine diplomatic history, attention to large-scale social transformation and ideological critique—you’d have to splice together Andrew Bacevich, Eric Hobsbawm and Edward Said. Williams did for The Nation pretty much what he did for American historiography. Starting in the 1920s, writers like Ernest Gruening and Carleton Beals provided sharp-edged reporting on what they openly called “American imperialism,” in Nicaragua, Haiti, Cuba and elsewhere. But this tradition, like Progressivism more broadly, had grown ineffective by the early Cold War, not just because of the era’s conformity but also owing to its own (at times) flat-footed economism. Williams fortified the magazine’s foreign-policy skepticism with an attention to ideology, psychology and culture capable of withstanding ongoing assaults by Cold War liberals, who charged that the magazine was too soft on communism. His presence was felt not just in his own reviews and essays, but in the work of other Nation contributors whom he directly influenced, among them Raskin, Barnet, Ahmad, Landau, Gar Alperovitz, Paul Buhle, Marilyn Young and Gabriel Kolko. That The Nation never gave up its opposition to militarism and war (unlike the way, say, The New Republic accommodated itself to Reaganism), and that it continues to publish investigative journalists like Jeremy Scahill and Nick Turse, owes much to Williams. In August 1980, The Nation ran an extended excerpt from what turned out to be Williams’s last book, Empire as a Way of Life, and distributed the issue to delegates at the Democratic National Convention, held that month in New York’s Madison Square Garden. It was meant to animate the party’s anti-imperialists, united behind Edward Kennedy’s insurgent challenge to Jimmy Carter. But the selection—and the book itself—read like an elegiac prose poem, pessimistic and paralyzing. Here, the “dialectical tension” Williams explored in his earlier work didn’t so much progress as unspool, providing no traction for dissent, no contradiction that could be leveraged to resist empire. The dispossessors became the dispossessed, stripped of the ability to think of themselves as social beings. Marx believed that the increased rates of exploitation involved in the labor process led to a steady expansion of human consciousness, but Williams argued that empire reversed the process: the constant quest for “surplus social space” resulted in self-barbarization and a deep anti-intellectual individualism. Cancer took Williams in March 1990, and for a short while Cold War triumphalism seemed to controvert his jeremiad. But the United States started bombing Iraq a few months after his death and hasn’t stopped since. And here we are, living not the tragedy of American diplomacy but empire burlesque, supporting rebels on one side of the Iraqi-Syrian border and fighting those same rebels on the other. 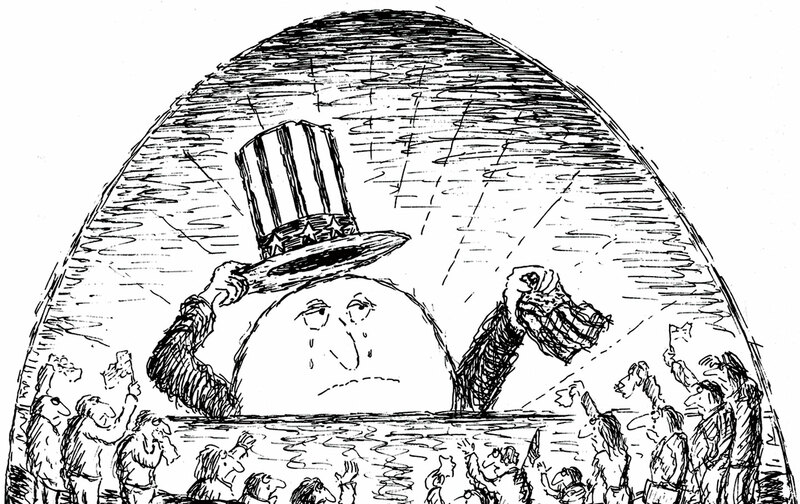 Williams taught that domestic reform in America has always been paid for with imperial expansion. In the mid-1800s, the federal fight against slavery went hand in hand with the fight against Native Americans and the final drive west. Progressives and New Dealers could use the government to distribute wealth a bit more equitably only if they also used it to open the world’s markets to American corporations. And in the 1960s, Lyndon Johnson couldn’t get the congressional votes for the Great Society unless he stood “firm on the frontier” in Vietnam. Williams didn’t live long enough to fully see the way the New Right switched the terms, reviving militarism to dismantle as many of those domestic reforms as possible. This is the “bizarre reality” that Ferguson and Rogers identified, which stands the meaning of “freedom” on its head. It would be easy to see Obama’s technocratic pragmatism as one more turn of the imperial wheel. He’s tried to make the deal, offering up drones and global counterinsurgency (by some estimates, the United States is involved in seventy-four foreign conflicts; Turse counts 134. Who knows?) in the hope of winning mild reform at home. But he is operating in a vastly changed context, having had the ground cut out from under him by his neoliberal and neocon predecessors. He can opt for war—as he has—but he can’t reap the dividends of empire.